Within her characteristically restrained chromatic range, Susannah Phillips’ latest body of work, on view at Lori Bookstein Fine Art, manages nonetheless to exude incredibly nuanced color. These paintings and drawings were all made over the last two years, the latter mostly from direct observation; the subjects consist of four motifs – two landscape views, a still life, and one domestic scene – each painted numerous times. 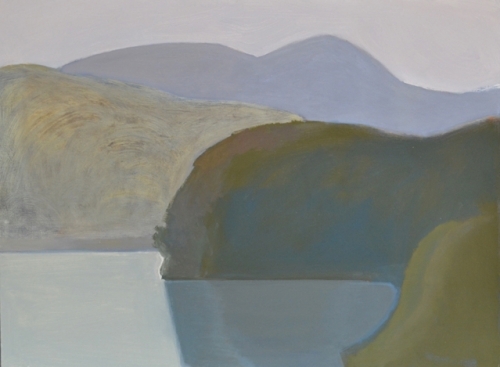 An unnamed horizontal landscape, featured in nine of the 28 works in the show, depicts a body of water surrounded by mountains or hills at different times of day. Her compositions play upon a fret of different perspectival depths: water wraps around a central mass of land located in the mid-ground; a sliver of land is occasionally foregrounded, more visibly in some pictures than others; an undulating mountain range sits just below the sky. In Landscape 3, where the morning air is thick, humid and hot, mountain edges are brought up to the picture plane, magnified and sharp. In Landscape 11, the most sumptuous of the paintings, the dawn is quiet, cool and soft, misty even, as the furthest mountain range recedes from view. This kind of comparison can be done between all nine within this group. As you move through them you can feel the sun and air shift as if you were growing to know the place. The absence of representational details grants these landscapes an unexpected second life. They have the capacity to suddenly flip to abstraction, for a moment losing their pictorial depth. Yet the muted and succulently specific color always shifts the landscape back into view. The change in light from painting to painting is sophisticated, creating strong implications of volume and space between landmasses. As you walk though the gallery, the landscape progressively reveals more dimensionality, with variations in the height of mountains, the position of the sun, atmosphere, and time of day. Time intervals between paintings seem no more than 30 minutes or an hour, allowing the artist to slow time down to the point of capturing the closest thing to what we can understand as the present. Phillips’ subjects, whether landscape or interior scenes, are transformed into vessels for explorations into light, volume, and form. Like Agnes Martin or Giorgio Morandi, her motifs seem to have emerged from a metaphysical search, from a need to infringe on the barrier between the concrete world and ourselves, to reach a point just beyond our grasp. These new paintings and drawings straddle a line between spirituality and philosophy as they begin to utter the unspeakable, the nature of time and the instability of reality and perception.